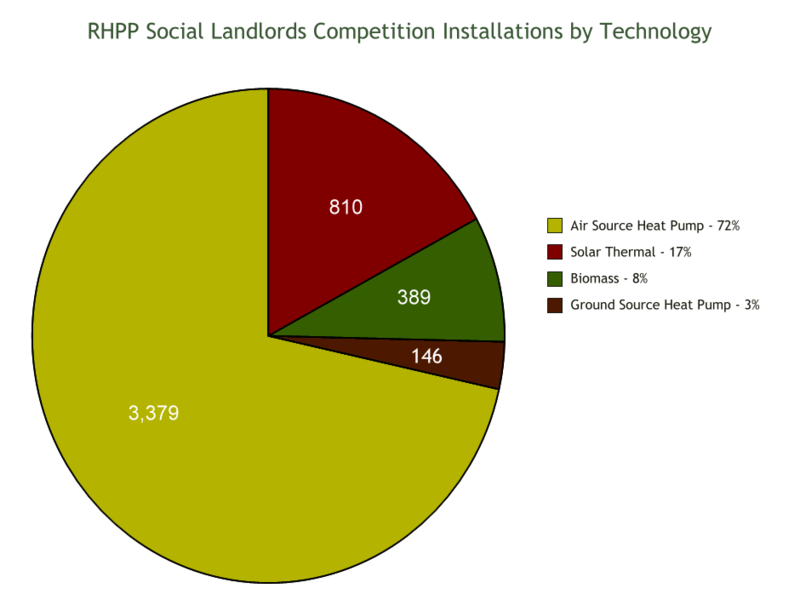 Following up on our recent UK Domestic Renewable Heat Update, we were asked about data for the social housing sector. Since August 2011, funding has been available through the RHPP Social Landlords Competition in 3 phases. 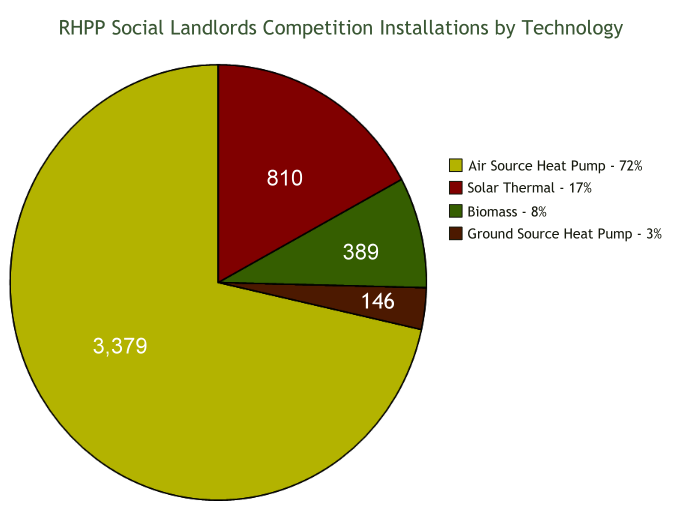 The RHPP Social Landlords Competition was intended to accelerate the deployment of renewable heating technologies in the social housing sector. Under the scheme, bids were invited from registered providers of social housing. The competition involved grants to support value for money proposals for projects installing biomass boilers, solar thermal systems, ground source heat pumps, air to water source heat pumps and water to water source heat pumps. The Phase 1 competition took place in August 2011 and saw 30 social landlords secure a total of £3.7 million in funding. Phase 2 took place from 28th May 2012 to 4th July 2012 and Phase 3 took place from 8th August 2012 to 9th November 2012. According to the Energy Saving Trust, Phase 2 and 3 combined saw funding for 132 social landlord projects to the total value of £9.4 million. There are 2 further social landlord competitions called the Fast Track, and Reach Out schemes but data has yet to be released on the installations under these. The figures below were released by DECC and apply to Phase 1, Phase 2, Phase 2 top-up, Phase 3 and Phase 3 top-up.